Eat|See|Hear is hosting an event at the Autry in Griffith Park on Saturday, August 2. The evening will include an assortment of local food trucks, a performance by LA band Kera and the Lesbians and a showing of the 1974 Mel Brooks comedy Western spoof “Blazing Saddles”. We'll be giving away bandanas from The Autry and shot glasses from Showtime to the first 1000 people to arrive. 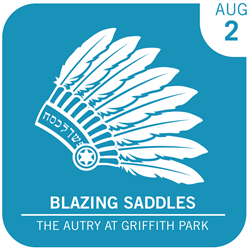 Los Angeles outdoor movies, live music and food truck event series Eat|See|Hear is hosting an event in Griffith Park at the Autry National Center on Saturday, August 2, 2014. Doors open at 5:30 p.m. and tickets are available for purchase in advance online and may also be purchased at the door on the day of the event. The evening will include a performance at 7:00 p.m. by LA band Kera and the Lesbians presented by Musicians Institute. The movie will begin at 8:30 p.m. The Autry is located at 4700 Western Heritage Way in Los Angeles and is situated within Griffith Park. Free parking is available across the street at the LA Zoo. The only entrance to the event is on the museum lawn next to the front entrance of the museum. An assortment of food trucks will be at the event including White Rabbit, Germany’s Famous Bratwurst, Rounds Burger, Luck Dish, Good Greek Grub, Coolhaus, My Delight Cupcakery, Brasil Kiss and more. Eat|See|Hear is LA’s premier outdoor movie, food truck and live music event series that brings an evening of fun to Los Angeles - area communities each summer. The third annual series is presented by SHOWTIME, featuring up-and-coming bands from the local music scene, the hottest food trucks, and the only 3-story high, 52-foot wide inflatable movie screen west of the Mississippi with the highest quality HD-projection and digital surround sound. Eat|See|Hear is produced by LA-based Trailhead Marketing, Inc. with audio-visual provided by Hollywood Outdoor Movies. For more information about the third annual Eat|See|Hear summer event series, consumers are encouraged to visit the Eat|See|Hear website at http://www.eatseehear.com, as well as the Eat|See|Hear Facebook page, Twitter feed (@EatSeeHear) and Instagram (@EatSeeHear) for the latest updates.